Home » Beauty » What the Hell Is a "Wet" Dry Shampoo, and Where Has It Been All My Life? What the Hell Is a "Wet" Dry Shampoo, and Where Has It Been All My Life? Is dry shampoo the best thing you can do for your hair? That’s an excellent question I am wholly unprepared to answer — partly because I’d rather live in blissful ignorance that drowning your roots in enough product to sink a ship can’t possibly harm your scalp. It is the glorious solution to my repulsive I-hate-showering problem, and frankly I like sleeping in too much to investigate further. Still, could I stand to spray a little more conservatively? Probably, but — much like my political leanings — I’ve found greater success in going the liberal route, spritzing with abandon until my hair reaches a point deemed socially acceptable. 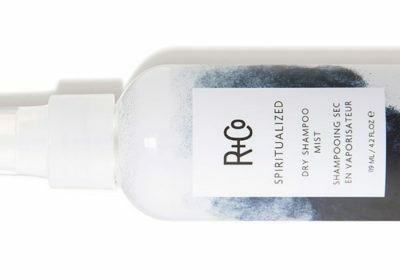 It’s only when I tried the R+Co Spiritualized Dry Shampoo Mist ($28) that I learned to appreciate the “less is more” mentality. For starters, this is unlike any other dry shampoo on the market — it’s a liquid, so it goes on wet. Here’s why that’s cool: rather than using physical powders to sop up next-day oil and grease, this formula contains micellar technology to actually break down the gunk without contributing to more build-up. I’ve found that this means I need fewer sprays to make my hair look clean, and restyling while it’s damp is far easier to maneuver than when it’s dry. “The wet application provides effective cleansing action without drying out hair and scalp, and our formula contains tiny balls of cleansing oil molecules that are suspended in soft water to gently draw out dirt, oil, and impurities,” said Thom Priano, celebrity hairstylist and co-founder of the brand. In other words: it gives you all the benefits of not washing your hair without spending all that extra time not washing your hair with dry shampoo. Priano also noted that this fact makes it the ideal product for after the gym, but considering I can’t justify the arm workout that comes with shampooing in the shower, I’m going to file that in my “good to know” folder — and hit snooze yet again.